Not only can distracted driving lead to increased exposures and expenses for your firm, but it can also result in major fines and penalties. Distracted driving is not just a concern for commercial fleets. In fact, the National Conference of State Legislatures estimates that 80 percent of U.S. drivers with cellphones use them while driving. What’s more, the NHTSA estimates that 481,000 passenger vehicles throughout the Unites States are driven while using hand-held devices on a daily basis. Sixteen states and the District of Columbia have banned hand-held phone use by all drivers as of late 2018.These states are California, Connecticut, Delaware, Georgia, Hawaii, Illinois,Maryland, Nevada, New Hampshire, New Jersey, New York, Oregon, Rhode Island,Vermont, Washington and West Virginia. Legislatures in other states have prohibited cellphone use by younger drivers or school bus drivers. Distractions can come from a variety of sources and affect your drivers at any time. While accidents aren’t always preventable, fleet managers can reduce the risk by creating and implementing procedures that limit distracted driving. Even the most experienced drivers can become distracted from time to time. In order to maintain safe driving practices, organizations must take a top-down approach to combating distracted driving. Only through effective policies and training can commercial fleets identify and respond to potentially harmful driving behaviors. • Create a driver safety program and a distracted driving policy. Regularly communicate your policies using things like emails, blogs and posters. • Use applications to detect when your drivers are on the road. Many of these applications prevent individuals from contacting a driver while their vehicle is in motion. • Instruct drivers to pull off the road and park if they need to use their phone or an electronic device. • Equip vehicles with lockboxes that drivers can use to store potential distractions, like smartphones and tablets. 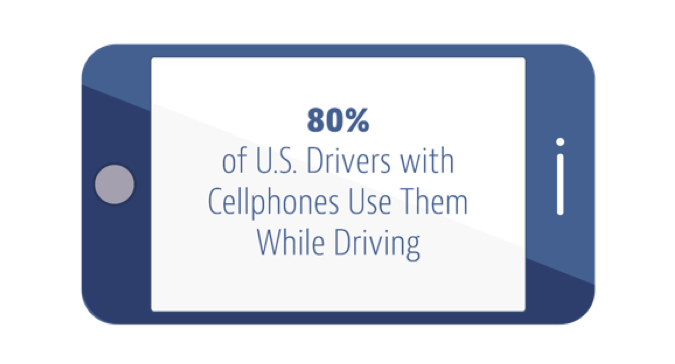 • Educate your drivers on the risks of driving while distracted. Use real-life examples and stories to explain how dangerous distracted driving can be. • Update your organization’s handbook, noting any disciplinary actions you will take if you identify unsafe driving behavior. • Ask your employees to sign a pledge form indicating their willingness to drive in a safe and courteous manner. • Work with drivers to plan trips. This ensures that drivers have a clear understanding of their routes, which can reduce the need for GPS and other potentially distracting navigation devices. • Manage driver schedules to ensure employees are well-rested between trips. • Use telematics, driver monitoring programs and in-cabin camera systems to evaluate individual drivers. Whenever possible, reward positive driver behavior to encourage a culture of safety. • Perform a safety audit, which will give you a high-level overview of distracted driving risks and other concerns.